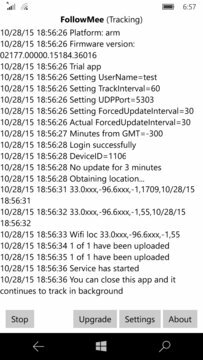 FollowMee GPS Tracker tracks location of a Windows device (phone or PC). 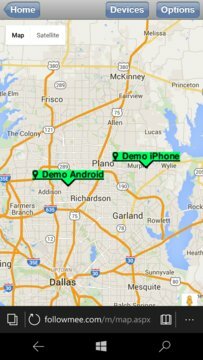 Installing this app to a device that you want to track, it quietly records its locations (GPS, WiFi, or cellular triangulation) and uploads to a secured server. To monitor location of your tracked device, you simply open the FollowMee web site (http://www.FollowMee.com) in any browser (either desktop or mobile). Using this app, you can track your children's movement daily, follow whereabouts of your family members or employees. In additions, you can locate your lost or stolen device. After you download and install the app, you are asked to register your user name and password. Once the app is started, you can monitor its location in the FollowMee web site.